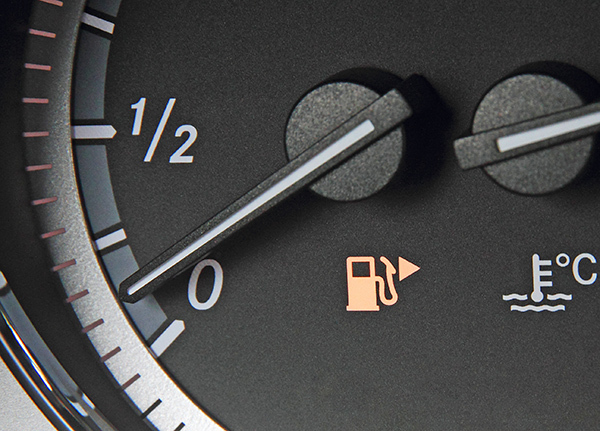 It can be tempting to drive your car on empty. Perhaps you want to make it to the gas station with cheaper prices, or maybe there isn’t a gas station available for a few miles and you forgot to fill up your tank. No driver plans on running out of gas, but if you do find yourself in this situation, it’s important to take the following steps to remain safe and calm until you are on the road again. The experts at CarRegistrationAdvisors.org know running out of gas can be especially dangerous on the highway, so use these tips if you ever find yourself stranded without fuel. Running out of gas will stress anyone out. The team at CarRegistrationAdvisors.org knows that it’s hard to see the bright side in this situation, but it’s important to remain calm and collected. The highway is a crowded, dangerous place to be stuck, but if you take the necessary precautions, you will make the situation much safer. If you know your car is about to run out of gas, be sure to pull over before you are unable to do so. Turn your hazard lights on to alert other drivers of the situation. Remain in your car to prevent unnecessary injury. Remaining calm will help you think with a clear head and get you back on the road faster. Roadside services like AAA are extremely beneficial during these situations. If you have a membership for roadside assistance, get a representative on the phone. He or she will be able to dispatch someone to bring gasoline to your location and have you on your way. The team of experts at CarRegistrationAdvisors.org recommends considering a roadside assistance membership to help you out in unexpected driving situations like this. If you don’t currently have a membership, you can call a family member or a friend to assist you. Make sure to always have a phone charger in your glove compartment to prepare for emergencies on the road. If you can’t contact anyone to come help you, it may be time to consider finding a nearby gas station that is a walkable distance away. Google local gas stations and see if you can make it there on foot. Walking from the highway to a gas station should be a last resort, but if you have no other options, it may be the best way to get your car running again. Inclement weather like rain or snow may make visibility nearly impossible, so let bad weather pass before leaving your car to ensure your safety. Another motorist may offer to drive you to the nearest gas station, and it is always advised to use your best judgement before getting into a car with a stranger. If something seems off or weird about the situation, just remain in your car and wait it out. It’s better to be safe than sorry, and you don’t want to put your life at risk by riding with a stranger.